If you are serious about your web presence, you must have to register a commercial domain name for your blog / website / business. Most of the bloggers start with free .blogspot sub-domain, which is actually good enough for learning purposes. However having a paid domain name gives an impact that the owner of this website will serve his customers / audience in a better way. Search engines also give you an edge in search engine rankings for having a custom domain name, matching your website’s theme or topic. You can choose anything to be your custom domain name for your blogger blog, but keep the following points in your mind before registering a new domain name for your blog / website. I would recommend GoDaddy for domain name registration, since they offer the best prices for domains and you won’t regret their domain registration service. But please avoid their web hosting services, as much as you can, because they are only good at Domain Name Registration. 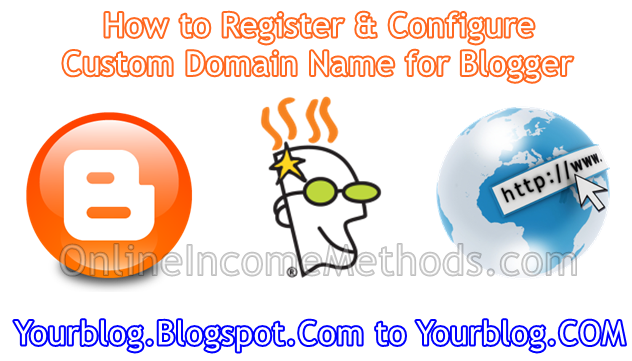 What you need to know before domain name registration? Its recommended that you must choose a better keyword for your custom domain name. For instance, this blog “Online Income Methods” is focused towards educating readers regarding the online earning opportunities, therefore it has “online income” keywords added in the domain name forming onlineincomemethods.com. The domain name should be easy to remember, so that you won’t miss the direct traffic. Registering multiple instances of domain names such as .com, .net, .org & others will help you to maintain & reserve your brand name. If you have chosen multiple domain name instances during registration, just choose the primary one for further configuration and later, add 301 Permanent Redirect to other secondary domain names. 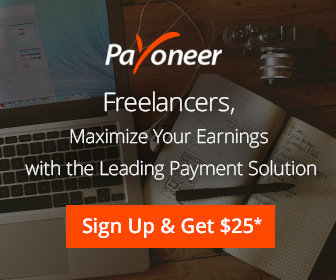 You can pay for your new domain name at GoDaddy with your Credit Card, Debit Payoneer Account, Debit Visa Card, PayPal & MoneyBookers. $3 .Com with Private Registration for $1 at GoDaddy! Please make sure to enter correct domain name registration information and proceed with the check out. Congratulations your brand new domain name has been registered. Now we have to configure this newly registered domain name as a Blogger’s custom domain. After completing your domain name registration at GoDaddy, head towards their DNS Manager, Select your domain name and edit its A Records and CNAME. 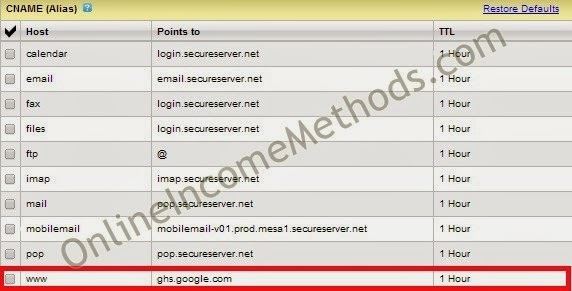 You can copy IPs from here. You can copy CNAME record from here. 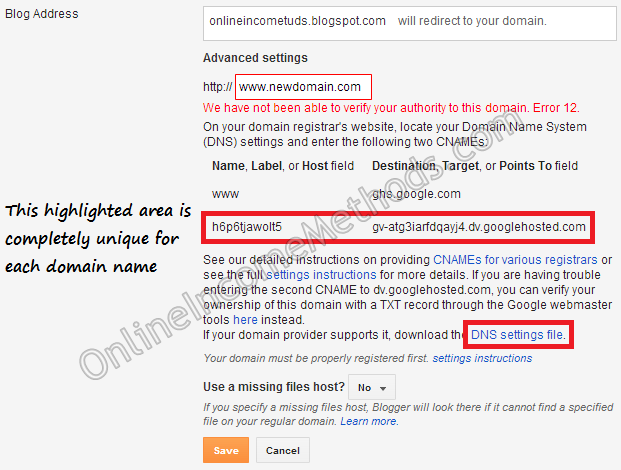 Configure your new domain name at GoDaddy for your Blogger Blog as mentioned above and save the settings. It may take 24 – 48 hours until the DNS changes you had made, propagate completely on the internet. Usually it does not take more than 10 minutes to see the changes, if you are using Google’s DNS on your computer. 4. Upon saving you will face a verification check. That we have not been able to verify your authority to this domain. Error 12. So you have to go with CNAME verification. 5. You will be asked to create another CNAME record at GoDaddy’s DNS Manager for your domain name’s verification purpose, in the similar way as we had created in step number 2 above. But you have to use unique Host & Points To Values. 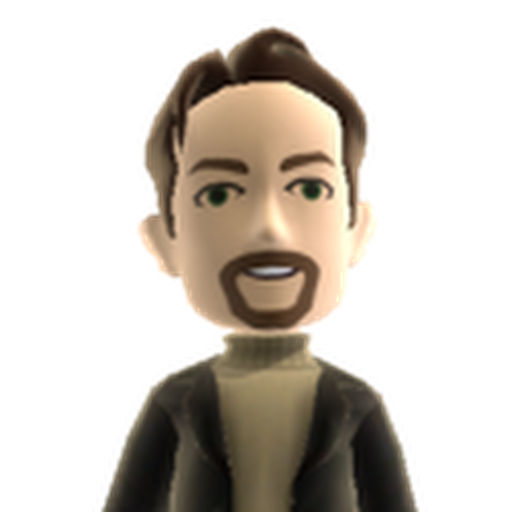 These unique Host and Points to values will be generated for you by Blogger itself, as I have highlighted in an above image. Copy them as your CNAME record and save the changes on GoDaddy’s DNS Manager for your domain. 6. Wait for half an hour and repeat step number 3 again. This time your custom domain name will be accepted by Blogger and your blog is ready to be used with your newly registered custom domain name. Make sure to tick mark redirection of your naked http domain to www address automatically. If you will not tick mark this redirection option, you will see a 404 error page at http naked domain name.